Long before its U.S. launch, Spotify was hailed as a knight in shining armor, driven by the idea that when it comes to streaming music, easy is even better than free. The new Spotify Play Button, available today and already featured on SPIN.com, makes it dead simple to listen to songs from Spotify’s vast library, free and legally. All without leaving the site you’re currently visiting. 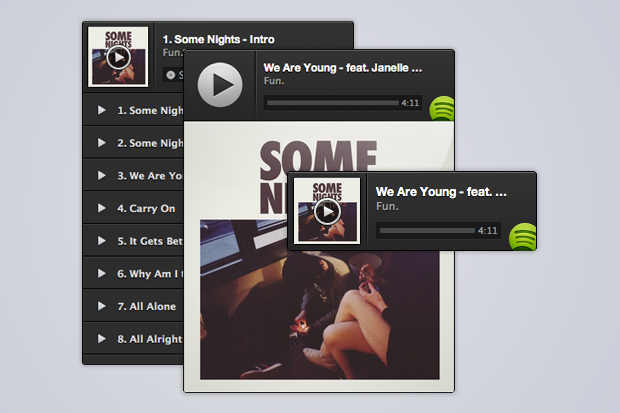 For music bloggers, it’s as simple as grabbing a song or playlist URI from Spotify and embedding the Play Button link. For users who already have Spotify accounts, the resulting window will play the tracks without redirecting them. To see how well it works, just poke around the SPIN.com reviews section right now.